« Limbo Walkthrough Guide – Stuck on Xbox Indie hit Limbo? 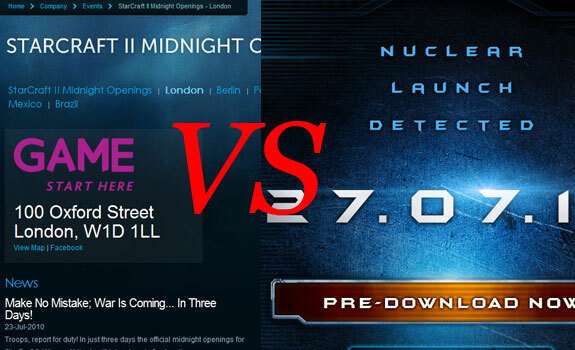 Midnight queue's or preload from the comfort of your home? Starcraft II is almost here, and you’ve already decided you’ll be playing this game non-stop for the foreseeable. But have you decided how you’ll be buying the game? With the option to pre-download via the super power that is Blizzard, order online from your favourite retailer or venture out into the heart of London’s Oxford Street for the midnight launch (no Steam for this game I’m afraid) there is plenty of choice. This entry was posted on July 25, 2010, 11:41 pm and is filed under PC. You can follow any responses to this entry through RSS 2.0. You can leave a response, or trackback from your own site.